This was posted this morning by Rosa Golijan, a senior editor and writer at msnbc.com. I believe she mostly covers tech. I guess that’s the Brooklyn Bridge. Look at the symmetry. I don’t know if she planned it, but the Sun is in that perfect “rule of 3rds” position, at least horizontally. Vertically, it looks about in the middle, which is no matter, because the “rule of 3rds” is just a starting point, a jumping off point. But it’s just enough here, along with the color, the warm orange filling the whole frame, along with every part of the photo, from the river, to the sky, even the way the bridge is angled, everything seems to be flowing towards this focal point of the Sun. And that gives it a “3 D” effect, or more warmly, makes you feel like you are in the photo. And the real “Coup de Grace” is that perfectly straight, sword like, streak of Sun light that at the same time seems to come at you, and yet pull you in, and also act like a beam or a “ballast” that grounds the photo, not just in our eyes, or even our mind, but down into the soul. 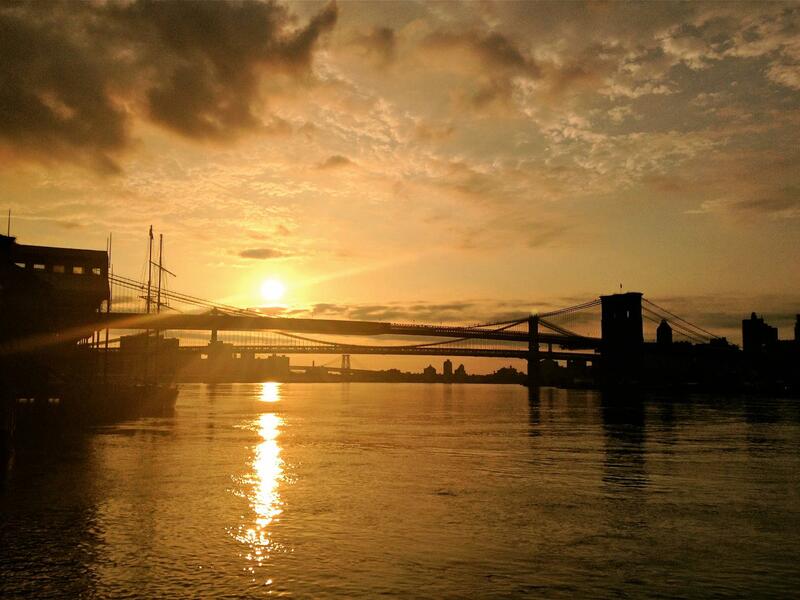 This entry was posted in Photos, Uncategorized and tagged brooklyn, new york, Photos, rosa golijan, Sun, sunrise on July 8, 2012 by Stephen Pickering.